I have all EPs and SPs. I have 4 adults, 1 toddler and one infant. All the adults run to swarm the infant and prevent the mother from interacting. I switched to FreeWill off and still the mother will not nurse her infant. Any ideas or suggestions (be nice ? You have only the Nursemaids plugin, but not the main Feed Baby mod? That's ASKING for trouble, dear! Quote: These are the Feed Baby plug-ins. They work ONLY with the latest (April 12, 2011) Non-auto and Special versions of my Feed Baby mod, enhancing it's functions. If you don't have one of the mentioned mods, these plug-ins will NOT do anything. See that green text? That's a link to the main mod. I think there is really something else in my game that is causing conflicts so if nothing comes to mind do not waste any more time with this issue. I will live without it. The thing is it worked fine before. I am thinking it may have an issue with the infant being made using Monique's Create Baby with X. Thanks for your time, dear BO. Nonni, you're NOT a pest, because the Pest EP hasn't been installed. The conflicts with TJ's "No Baby Toddler Swarming" is normal! Don't worry about that one, because it's supposed to do that. 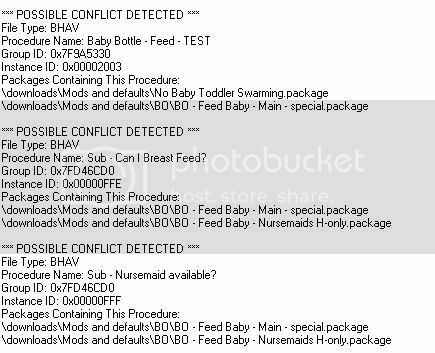 The conflicts between Feed Baby - Main - Special and the Nursemaids plugin are also normal. The descriptions at both those download pages TELL you that these conflicts will happen. There's no problem there. I'm sorry your game chokes at this, but my mods and these conflicts are NOT the cause of your trouble. I have no idea what *is*, though. Did you recently try deleting the .cache files? Because sometimes that helps. You are a dear man. I am relieved to hear the "Swarming", "Feed Baby" mods conflicts are normal. Actually, I am delighted that I can go back to using them. I am becoming more and more convinced it is the Create Baby mod. Upon removing it the game works but next I will add back your mods for Babies. I am paranoid/obsessive about removing .cache files, cigen and there is one more that the game generates but can't remember it off the top of my head. Consider my issue solved. Big Hugs! *I don't care what Shell does to me. Well, there's REALLY nothing wrong with deleting those .cache files... Even if you were to talk to an EAxoid about any kind of trouble, the FIRST thing they'll want you to try is to remove those files. Especially if your game crashes for no obvious reason. The cigen file is also harmless to destroy, but that's less often needed. I believe that one has more to do with the Body Shop. And then there are the five files in the Thumbnails folder. Deleting those helps to clean up your catalogs. The only disadvantage there is that the next time you play your game, all the thumbnails on each catalog page need to be created anew, which causes long waiting times while browsing the catalog. And that goes for Build and Buy mode as well as for CAS mode. I hope you understood that I am most conscientious about deleting my .cache files. Everything is working fine since I removed Monique's Create Baby with X.
I understand, dear, really I do! But being careful and being stubborn are two completely different things. The first is wise, the second can be stupid. Removing them frequently is better than keeping them in at all costs. I remove my .cache files every day! And when I remove or change or replace or update a mod, I also immediately delete the cache files to prevent my game from breaking! My game NEVER crashes! Ask anyone else, and they'll all tell you the same thing! I think that if you destroy the cache files now, maybe your game will play normally, even with Monique's mod back in. There's REALLY no harm in trying.